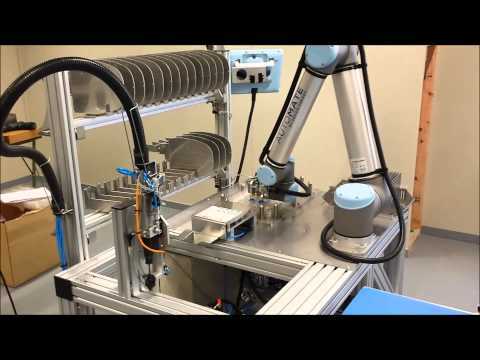 Universal Robots has broken down the barriers. Up until now, many companies have had to abandon the idea of automating numerous tasks and processes because the traditional robots are either too large, too expensive, too noisy, or inflexible to implement. 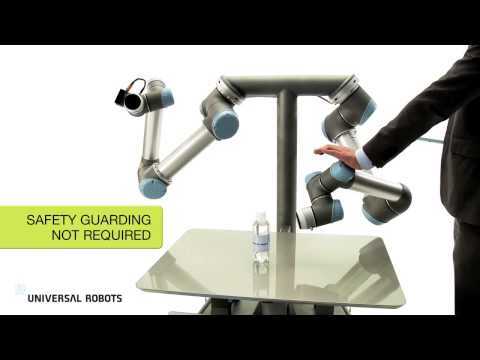 Universal Robots are extremely compact and can be used without any safety guarding. Any facility with repetitive processes can benefit from them. The robots are lightweight and can easily be moved around within your facility. Programming is done intuitively. Simply grab the robot arm and show it the desired movement. The robot will then remember the movements. 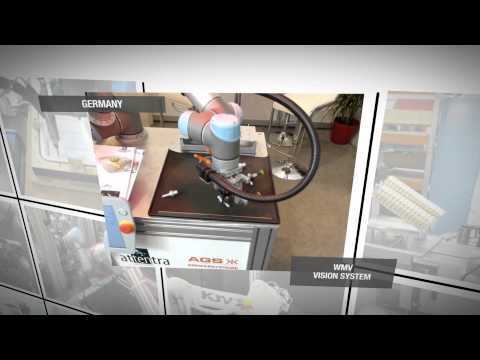 The robot is controlled from a handy, touch-sensitive screen with a graphical user interface. UR10 Robot at Aircraft Tooling Inc. Equipped with intuitive programming, versatile use and an almost endless list of opportunities for add-ons, the e-Series is able to complement production regardless of your industry, company size or product nature. The e-Series is designed to grow in capability alongside your business, taking on new tasks and finding new uses so you will always be able to stay ahead of your competitors. The ultra flexible Universal Robots UR3 delivers high-precision accuracy for smaller production environments. The UR3 can modulate payloads of up to 3 kg (6.6 lbs). Designed for shorter reach environments, the UR3 has a reach radius of 500 mm (19.7 in) – allowing it to be deployed in tight spaces and add value to virtually any production environment. The UR3 also has InfiniteSpin™ on the last joint, allowing you to use it for screwing tasks without having to add additional devices. The UR-5 is a 6-axis robot arm with a working radius of 850 mm / 33.5 in and a payload of 5 kg (11 lbs). With a weight of 18 kilos the UR5 can easily be moved around in the production and used in many different instances. The UR-10 is a 6-axis robot arm with a working radius of 1300 mm / 51.2 in, and a payload of 10 kg (22 lbs). With a weight of 25 kilos the UR-10 can easily be moved around in the production and used in many different instances. With the user friendly software, the robotic arms can be easily and quickly programmed to perform new tasks.